Human Diagnostics Xcellsior Plus Flow Cytometry AIDS HIV CD4 Monitoring . New Life Scientific, Inc.
Human Diagnostic's Xcellsior PLUS provides a dependable, compact, instrument for monitoring cell counts for AIDS patients. The product is portable and meets European standards, but it is not FDA approved for diagnostic use; the Xcellsior may be appropriate for research use only in a lab setting. The Xcellsior PLUS model flow cytometer uses a green solid state laser (532 nm) and three optical channels to monitor fluorescence. The CD4 count and CD4 percentage are detected using proprietary reagents with patient samples through the fluidics system. The technician flushed water through the sheath and did not register any clogs or errors. 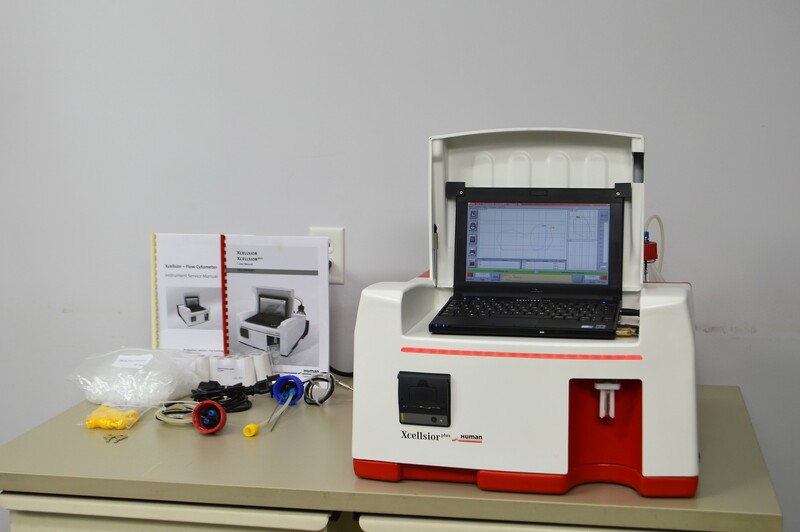 The software workstation paired with the instrument and produced a graph that the technician was unable to interpret, but confirmed that this product demonstrates functionality. The manufacturer no longer supports this instrument, but they appear to continue selling the reagents; the customer will need to inquire about availability directly with the manufacturer.